I feel left out. I am a VIP member of Road Runner Sports and I never received this email! Hmmm, unless I've been pranked. Weird, when I post the redirecting link it doesn't do anything is here it is in plain text. P.S. 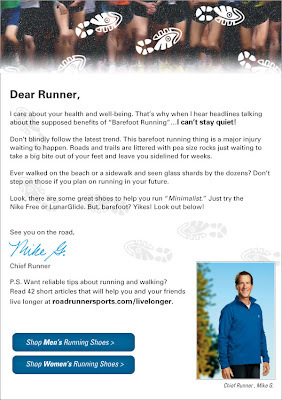 The Chief Runner mentions the Nike Lunarglide in his letter along with the Nike Free. I have been running in the Nike Free on my shorter runs and like it very much. It has a great deal of flexibility in the sole. As a result of my good results with the Nike Free I just purchased a pair of the Lunarglides and found that the sole flexibility that I enjoyed so much in the Frees is not there in the Lunarglide. The Lunarglide is a far cry from running barefoot or even from running in the Nike Frees. Thanks, Al. I'm actually in the market for a new pair of shoes. Ideally, I like to go with something like my son's XC racing shoes--flat sole, no cushion, and lightweight. And I'd leave the spikes off. I reckon I'll be trying out some options before buying. I don't want to have to buy shoes for a while.